A beautiful framed leather silhouette by artisan Aphisit Jromsri. In this spiritual work, Buddha sits in the lotus position, commonly used for meditation and relaxation. He is perched atop a lotus flower symbolizing purity and divine birth. 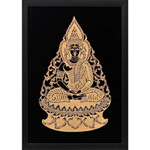 Handcrafted leather silhouettes are an ancient tradition in the Thai kingdom, especially in the South. 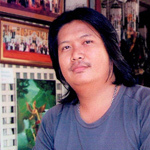 They are used as characters in shadow plays called nang taloong and as temple and palace art. Artisan Aphisit keeps the tradition alive for you with this exquisite silhouette. He carves and hammers the silhouette from water buffalo hide. He paints it and, after drying, places it on a velvet support. Next he frames it, with a protective glass and places a hook in the back.